With a name like Star Wars Battlefront, putting together two of the biggest names in their own genres, you know expectations are high and the hype train has gone into turbo mode. 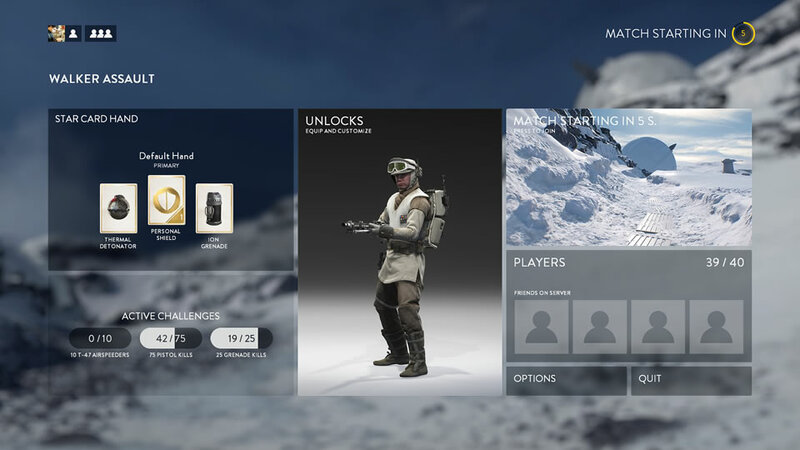 With about a week to launch date, fans were in for a treat thanks to DICE and Electronic Arts as the beta was opened to the public to whet their appetite. 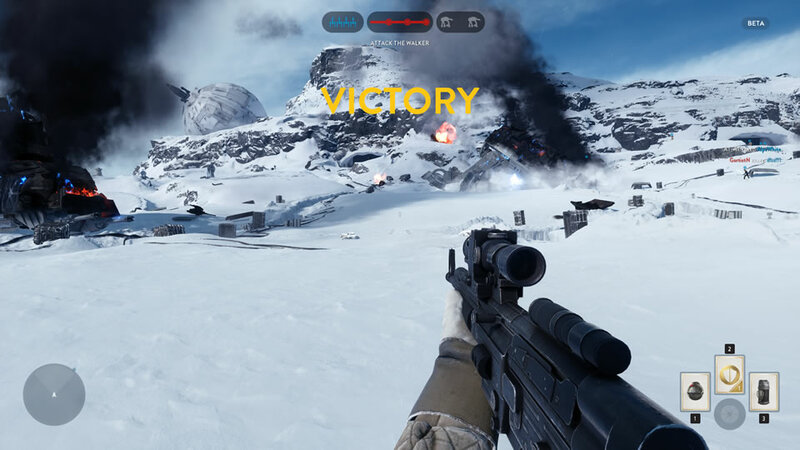 While there are the usual survival and a death match meets capture the objective maps, the highlight of the Star Wars Battlefront Beta has to be the Walker Assault map or as many who grew up on Star Wars would know as the Battle of Hoth. Being the rash first person shooter (FPS) gamer that I am, I rushed into the map without levelling up and unlocking some of the other gear and weapons which turned out to be a huge mistake. Without the ION Grenades and ION Shot upgrades, taking down the smaller All Terrain Scout Transport (AT-ST) Walkers were a painful experience and not having the personal shield meant I was a free frag trying to activate the Link Stations to call in the Y-Wing bombers to attack and disable the All Terrain Armoured Transport (AT-AT) Walkers. In the end it was a major victory for the Galactic Empire as the AT-AT Walkers reach their objective and blew up the Rebel Generators. Just as how the Battle of Hoth played out in the movies, it was a one side battle for all the Walker Assault matches I played in. The closest match I was in sees one of the AT-AT Walkers destroyed but the other one still reaching the objective. Where were the concentrated orbital strikes when the AT-AT Walkers were venerable? 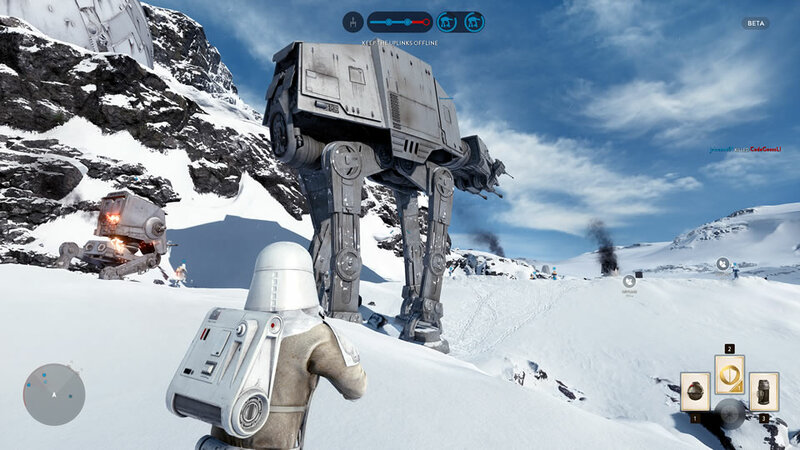 Where are the T-47 Airspeeders to tie up the legs of the AT-AT Walkers? Well I guess just like the movies, it was never meant to be. Thankfully the next game after puts me on the side of the Galactic Empire where I took on the role of the forgettable Strom Trooper. 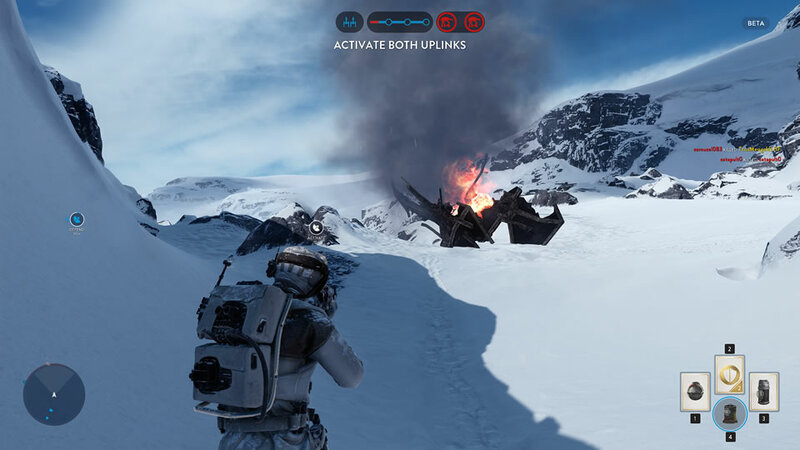 Here my role is to stop the Rebels from activating the Upload Links and to stop them from destroying the AT-AT Walkers. While I watched my fellow soldiers in white die in the numbers (like in the movies), victory came easy match after match. It was also from this side I realised why the Rebels never won (or at least when I played on the Rebel Side). Rebel Orbital Strikes were not kept for attaching the AT-AT Walkers but on Groups of Storm Troopers. T-47 Airspeeders either don’t get enough air support from X-Wings and get destroyed by Tie Fighters and Tie Interceptors before they can use the magnetic harpoon and tow cable to take down the AT-AT Walkers or they don’t know that’s the way to do take down the AT-AT Walkers. Well not like those on the Galactic Empire side are any better but I guess the mechanics of the map meant that the Rebels will always be the one needing more coordination and team work. Update: Looks like I finally have my first Rebel Victory in Walker Assault~! 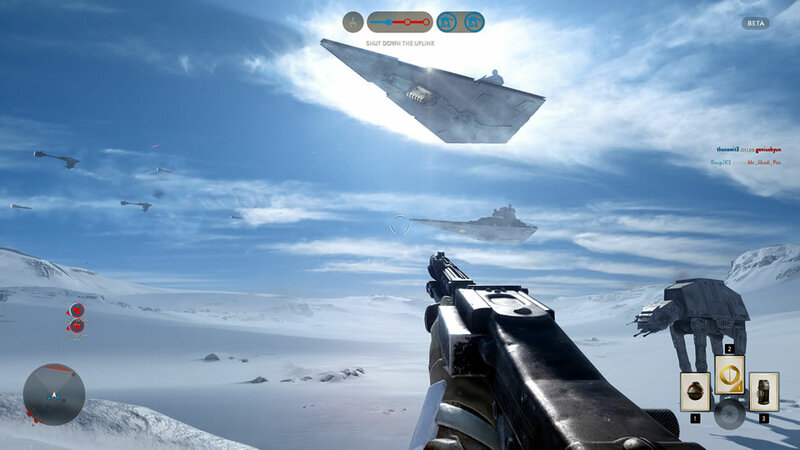 While it can be argued that maybe map mechanics need more tuning especially the Walker Assault ones, everything else about the Star Wars Battlefront Beta was well polished, showcasing the beauty of the Frostbite engine and the experience that DICE has building FPS games. From the texture of my standard issue Storm Trooper blaster to how the X-Wing flies and fires its weapons, it felt like I was there on Hoth fighting to repel the Galactic Empire and their weapons of war or crushing the Rebels in the name of the Emperor. While the Playstation 4 did well to render the graphics, it was of course no match for my PC which is powered by an Intel i7 CPU & SSD, 16GB Kingston RAM and the nVidia 980Ti factory overclocked by Zotac . Playing in 1440p also gave more resolution for rending the various objects and the Rebel Hanger looked fantastic with blasters and grenade fire all over the place. Sound wise, everything felt authentic from the various comms channel voices to blaster sounds with my SoundBlaster ReCon3D and Logitech Z906. Even the iconic lightsaber sounded so good, I forgot I had Darth Vader looking to slice me up for that split moment. Overall the Star Wars Battlefront Beta has definitely set the bar high and I am sure I will not be the only one heading into A Galaxy Far, Far Away as DICE and Electronic Arts has a gem waiting to be discovered.